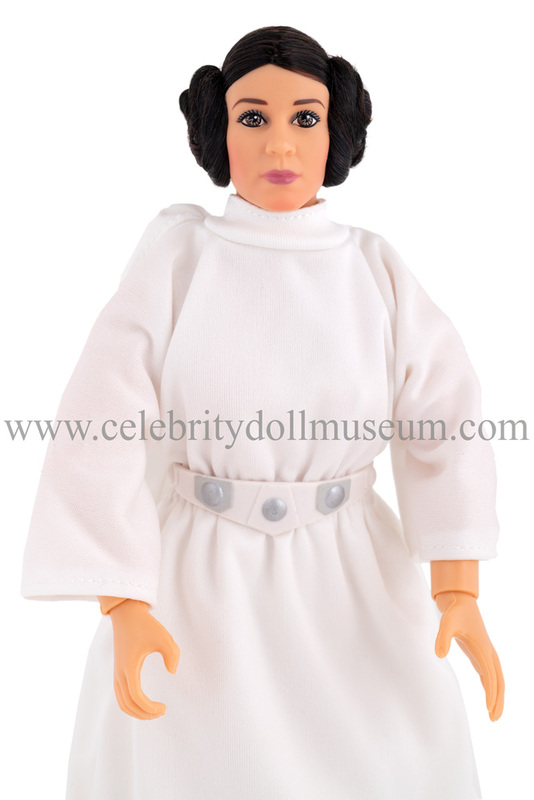 The Carrie Fisher celebrity doll portrays her as Princess Leia Organa of Alderaan from the Star Wars original trilogy. 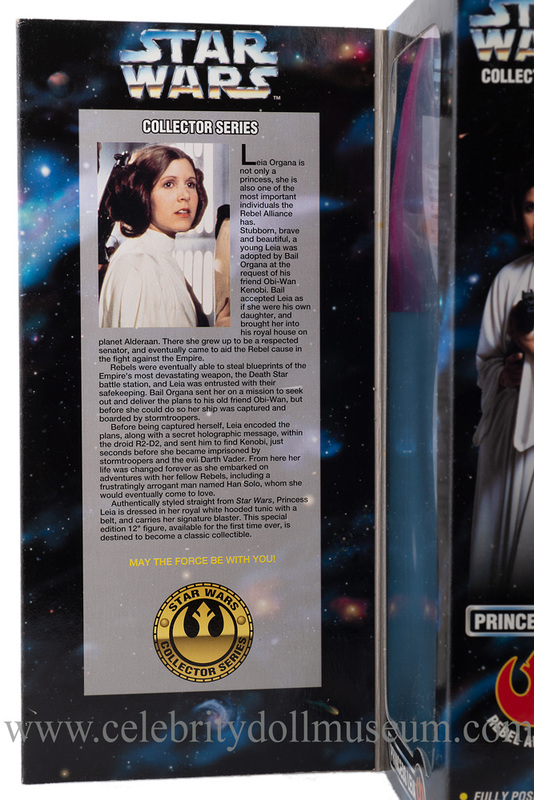 The Fisher action figure was made by Hasbro in 1996 as part of their Star Wars Collectors Series. 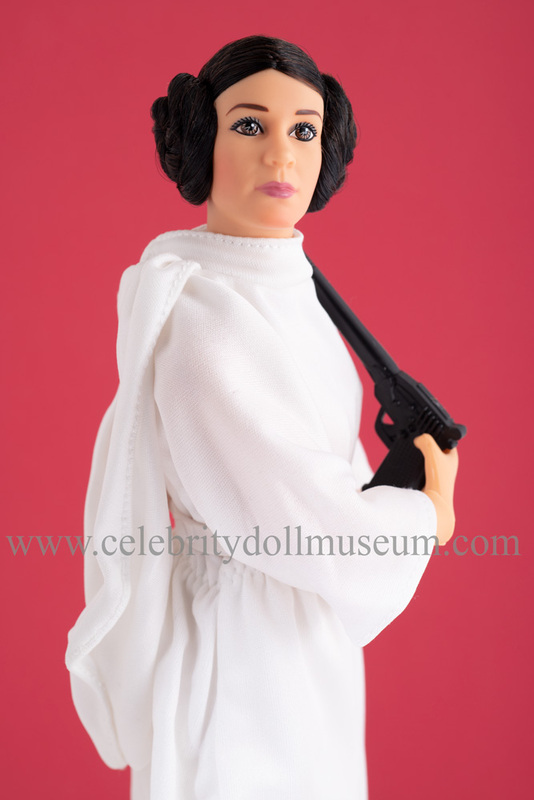 Carrie Fisher, an American writer, actress, and humorist died on December 27, 2016. 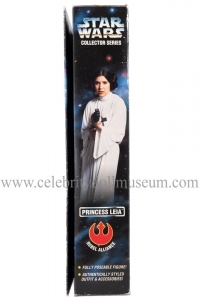 Leia Organa is not only a princess, she is also one of the most important individuals the Rebel Alliance has. Stubborn, brave and beautiful, a young Leia was adopted by Bail Organa at the request of his friend Obi-Wan Kenobi. Bail accepted Leia as if she were his own daughter, and brought her into his royal house on planet Alderaan. There she grew up to be a respected senator, and eventually came to aid the Rebel cause in the fight against the Empire. 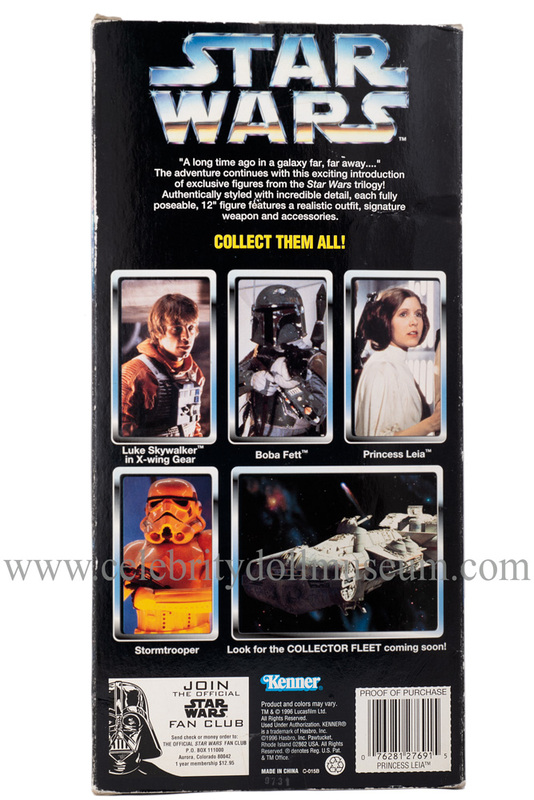 Rebels were eventually able to steal blueprints of the Empire’s most devastating weapon, the Death Star battle station, and Leia was entrusted with their safekeeping. Bail Organa sent her on a mission to seek out and deliver the plans to his old friend Obi-Wan, but before she could do so her ship was captured and boarded by stormtroopers. Before being captured herself, Leia encoded the plans, along with a secret holographic message, with the droid R2-D2, and sent him to find Kenobi, just seconds before she became imprisoned by stormtroopers and the evil Darth Vader. From here her life was changed forever as she embarked on adventures with her fellow Rebels, including a frustratingly arrogant man named Han Solo, who she would eventually come to love. 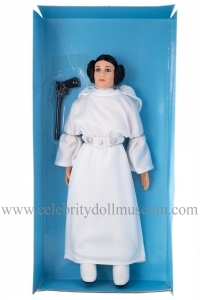 Authentically styled straight from Star Wars, Princess Leia is dressed in her royal white hooded tunic with a belt, and carries her signature blaster. 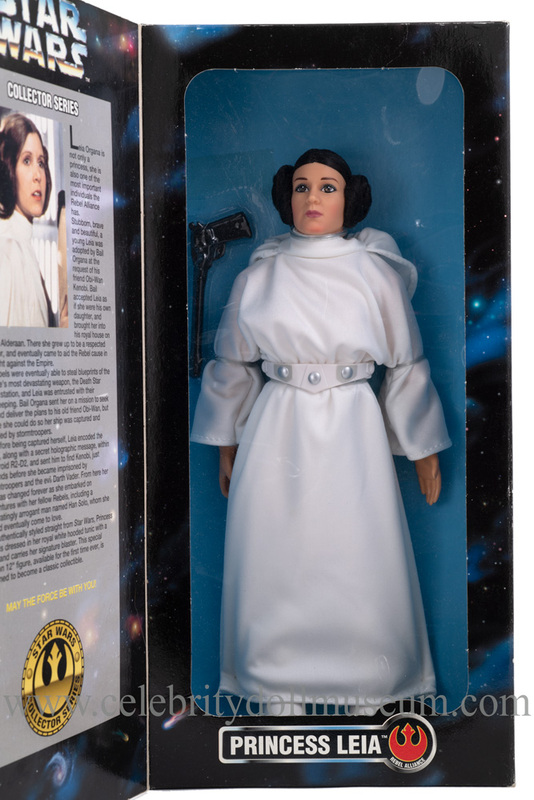 This special edition 12″ figure, available for the first time ever, is destined to become a classic collectible. 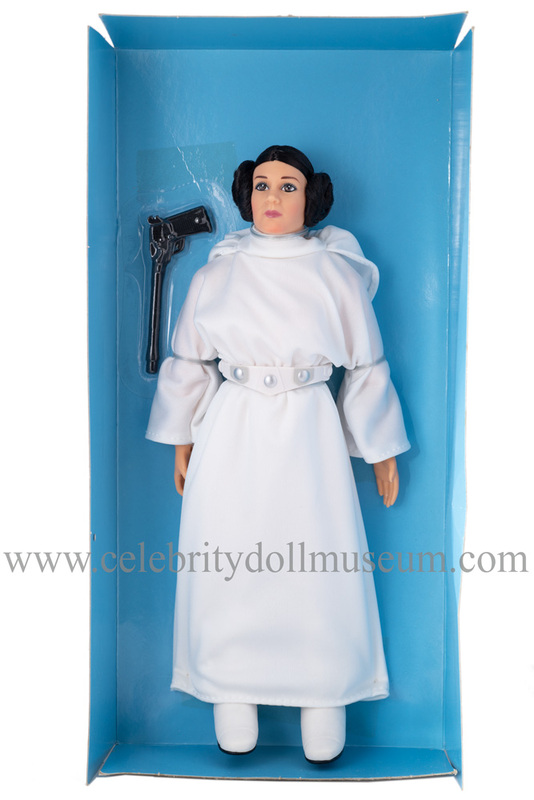 The Fisher doll wears a white flapped, hooded, high collared dress with a lining, and snaps in the back with a slight elastic waist- very sturdy and well finished for play. The rubber belt has a built in closure to snap it closed over the elastic. The white rubber boots with black soles appear to be glued on, but possibly would come off if you pulled hard enough. Underneath the costume is an ankle-length sleeveless long undergarment. The long underwear is sewn on and not removable and tucked into boots. 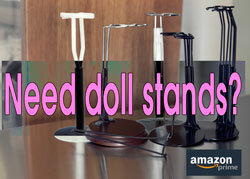 The doll is fully articulated–the head , shoulders, biceps, arms, wrists and knees twist or bend. 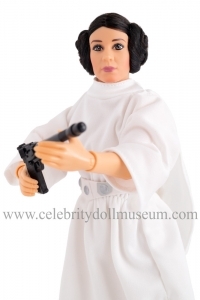 The action figure comes with a black plastic blaster gun. 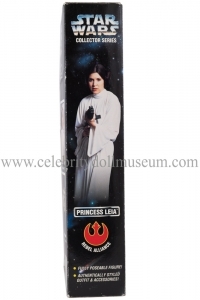 The Celebrity Doll Museum has many 12 inch Star Wars action figures in the collection.